Located in Gaobei Village, about 5 km. 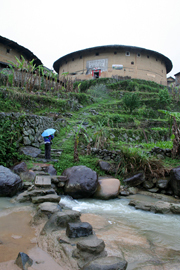 away from Hongkeng Tulou, Chengqilou is the largest of the earth buildings. 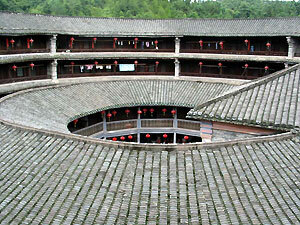 It is almost three hundred years old and is made up of four concentric circular buildings. This King of Round Earth Building has altogether 400 rooms and used to house 80 families, totaling more than 600 people in its prosperous days. The most significant feature of this huge collective dwelling is that all residents are equal in their share of living spaces. No traces of the feudal patriarchal distinctions between senior members of the family and the younger generations predominant in the "Five Phoenix" (Fuyulou) type of dwellings can be found here. Such a mode of tribal habitation is a rare phenomenon in the feudal days".